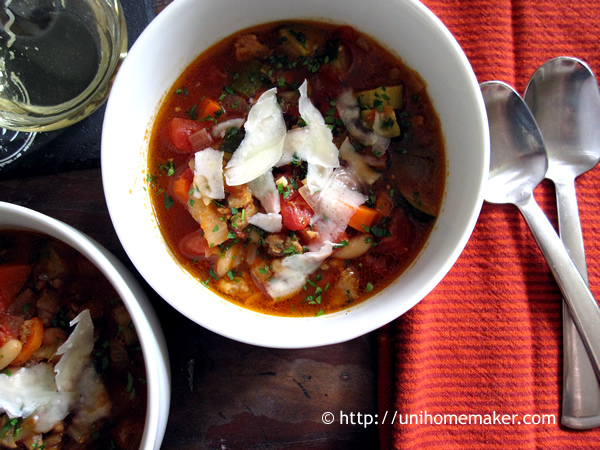 I’m starting to come around when it comes to Minestrone soups. I’ve made this version several times with wonderful results. The original recipe calls for ground beef but you can substitute with sweet Italian sausage, which is what I have done here. Or spicy Italian sausage if you prefer your soup with a kick. My butcher carries a variety of sausages; turkey, chicken and even Chorizo. If you don’t care for sausages, pancetta would work well too. I like to pair my soups with grilled cheese sandwiches or Panini. Although garlic bread or any homemade savory bread would be delicious. In a Dutch oven over medium heat add sausage and olive oil. Break up sausages with the back of a wooden spoon. Cook until most of it are browned. Stir in onions, carrots, celery and garlic. Cook until vegetables are soft, about 5-7 minutes. Season with salt and pepper. Then add bay leaf and tomato paste, mix to combine. Then add in diced tomatoes, cannellini beans, beef broth and zucchinis. Bring mixture to a boil. Cover and reduce the heat. Simmer soup for 20-30 minutes or until zucchinis are cooked through. Discard bay leaf and check for seasoning. Ladle soup into a bowl, garnish with parmesan and parsley. Love the idea of this. Although, a sweet Italian sausage?!? I’d never find that here. Shame one of my local stores aren’t selling their amazing trad sausages with sun ripened tomatoes as they would’ve been perfect! Well, trad sausages with a couple of pieces of sun ripened tomatoes, finely chopped, just might do the trick. Let’s wait and see! This looks so filling and nice. Warm pita would go so well with this. Thanks! 🙂 I’m not big on pita bread and soup as I feel it’s not substantial enough as a meal. But do have it with if you enjoy it. 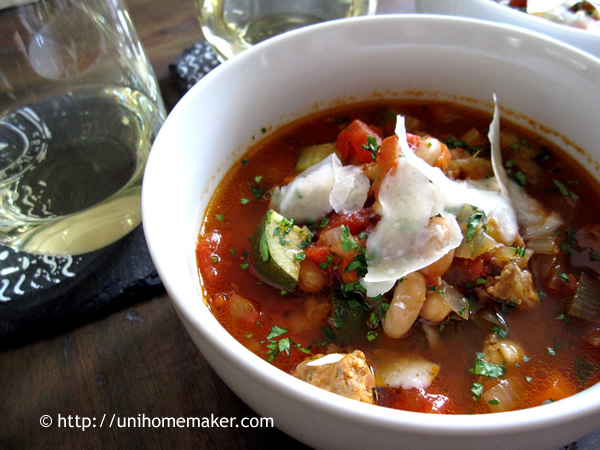 Another of my favorite combinations – Italian sausage and beans. Love the flavors in this soup. I’ve a couple “heels” from some parmesan and they’d add a great flavor to the broth. I’m not a big fan of beans but this soup looks so scrumptious I might just have to give i it a go. wow, I will definitely try this dish asap ^^ btw, we don’t have cannellini beans here, so can I replace with some other ingredients? You can substitute with Great Northern beans. Cannellini beans area sometimes called white kidney beans so maybe your store goes by that name? Anne, I love Giada and this looks incredible on every level possible. I definitely need to make this. I hope you don’t mind if I reblog your link on my reblog page? Cannellini perfetti x il minestrone nice chooise Anne!!! Looks yummy! 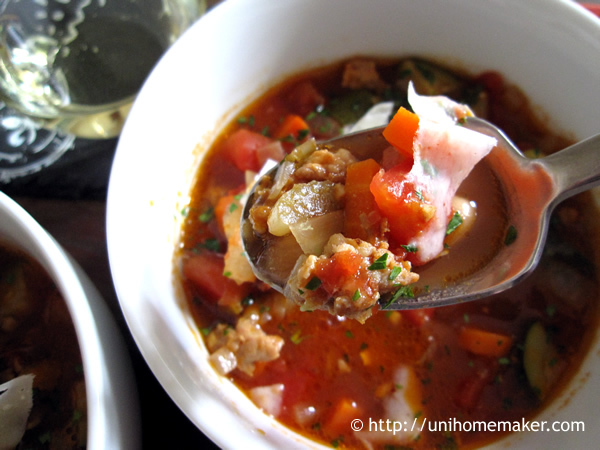 Sweet Italian sausage is one of my favorites, perfect choice for your minestrone! I’m feeling hungry just looking at the photos! I usually make blended soups, but this looks like it would be really good for a cold day. Thanks Sarah! 😀 I adore blended soups but every now and then, a good hearty one is so satisfying on a cold day. I like this. So yummylicious!!!!!! Am going to give this a try. Thanks for sharing.